My current research concerns issues of authenticity and deception in China in the late Ming (1368–1644) and early Qing (1644–1911) periods. I am working on a book about the invention of an entire category of objects, so-called Xuande incense burners (Xuande lu 宣德爐), that ostensibly date from the early fifteenth century. I argue that they were in fact invented in the sixteenth century and that the received understanding of them represents an accretion of many layers of fiction, forgery, and fancy. My other interests include the history of metallic money (especially silver) in China, grammatology (the study of writing systems), Chinese epigraphy and calligraphy, and the history of classical scholarship in China. 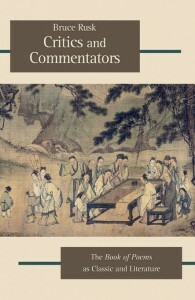 My book Critics and Commentators: Book of Poems as Classic and Literature was published in 2012 by the Harvard University Asia Center, as volume 81 of the Harvard-Yenching Monograph Series. This monograph examines how scholars of the canonical collection of ancient poems known as the Book of Poems or Poetry Classic (Shijing 詩經) borrowed from literary critics without attribution and even resorted to forgery to make appealing new ideas look old. By unraveling the relationships through which classical scholarship on the Book of Poems and theories of literary interpretation co-evolved from the Warring States Period (479–221 bce) through the early Qing period, it shows how the ancient classic was a catalyst for intellectual innovation and literary invention. “Where the Truth Lies: Evidence and Argument in Late Imperial Debates about the Great Learning,” in Anne Cheng et al., eds., Uses and Abuses of the Great Learning, Collège de France, Les conférences du Collège de France (Forthcoming). “Old Scripts, New Actors: European Encounters with Chinese Writing, 1550–1700,” East Asian Science, Technology and Medicine 26 (2007).